Hey, I’m MaShelle – your Fit & Fabulous Coach! I’m an AFAA certified Group Fitness Instructor, Health Coach, and a woman over 40 who just wants to live a happy, well balanced life. I have a Bachelor’s Degree in Psychology from Georgia State University and an MBA from the J. Mack Robinson College of Business. I live in Atlanta, GA with my wonderful husband, Ron. My husband is a professional body builder and personal trainer, so as you can imagine, healthy eating and fitness is inevitably a part of our lifestyle. We walk the walk and talk the talk! I was inspired to start the Jiggle Free Zone to help women learn how to eat healthy, live an active lifestyle and look fabulous doing it! Subscribe to my YouTube channel for my workout proof hair tutorials, makeup & glam videos, and of course my fitness videos you can do right at home! My ultimate goal is to empower women to feel strong and confident and take care of themselves, not only physically, but emotionally and spiritually too. 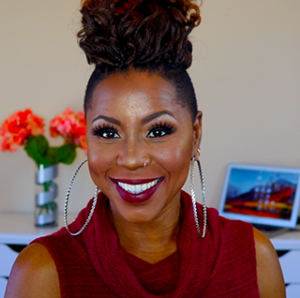 Be sure to sign up for my Fit & Fab Newsletter and connect with me on social media so you never miss my tips for living fit & fabulously! You’d be surprised to learn that even as a fitness instructor, I can still pack on the pounds if I don’t watch what I eat. I LOVE good food! So I’ve spent years experimenting with making healthy meals that also taste good. You can find those here. My weight loss transformation story isn’t tragic and it won’t make you cry. In November 2010 I just got fed up with my clothes not fitting and being overweight and decided to do something about it! Then and there I decided to exercise regularly and eat healthy for 1 solid year. In five months, I lost 32 pounds and 4 dress sizes and haven’t looked back since!